Food is a big part of health, and it goes beyond eating enough nutrients and avoiding sugar. Humans have been influencing plants for tens of thousands of years, and sometimes, plants have influenced us. Many cultures even use food to maintain and modify health, creating diets for certain health types and choosing foods that help the body with certain conditions. 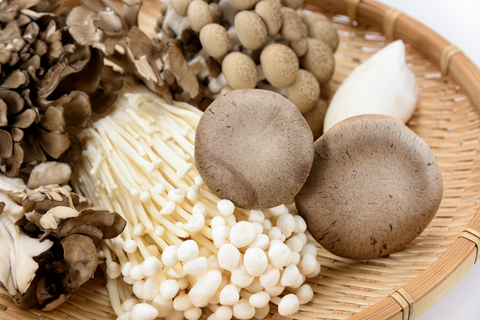 Maitake Beta-Glucan Extract has four mushrooms: Maitake, Shiitake, Agaricus, and Reishi. While each a little different, they all support health and wellness by stimulating the immune system. Traditionally, Maitake has been used to manage diabetes, hypertension, and other diseases. It helps protect cellular health and stimulates immune system cell production against pathogens like viruses and bacteria, and may even help the immune system regulate appropriately (potentially lessening allergies). Peer-Reviewed Clinical Trials have ound maitake helps to stimulate the immune system. While it’s good to have extra immune support going into cold and flu season, daily immune support as a preventative is good to have, too. Stress, pollution, lack of sleep and other factors can weaken the immune system, not only making it easier to get sick, but making it more likely it will be a serious illness. Don’t worry about working a variety of mushrooms into your diet everyday, instead, get the support from a variety of well-known immune boosting mushroom with Maitake Beta-Glucan Extract.